Presence of oxDJ-1 in RPE cells subjected to oxidative stress. 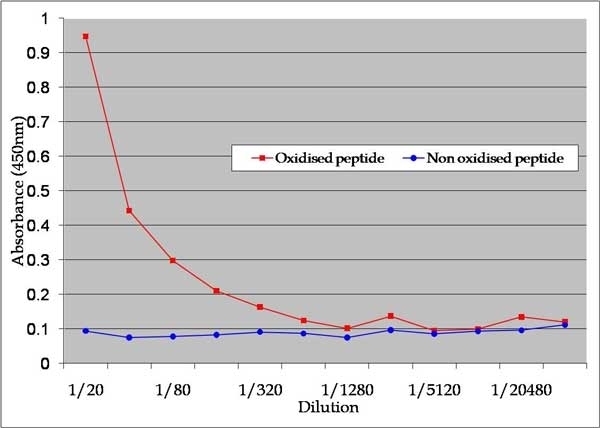 ARPE-19 monolayers were treated with increasing concentrations (0 to 800 μM) of H2O2 for 1 hr (A) and 18 hs (B), harvested, and analyzed by immunoblot assay with oxDJ-1 antibody (upper panel). Protein loadings were confirmed in replicate blots probed with GAPDH (lower panel). Each lane contained 20 μg of protein. A dose response is observed when cells are exposed to increasing concentrations of H2O2 for 1 h (A, lanes 1 to 6) and 18 hrs (B, lanes 7 to 12). Confocal immunofluorescence staining of baseline ARPE-19 cultures (C) fixed before extraction with Triton X-100 and labeling with oxDJ-1 antibodies revealed absence of oxDJ-1. However, oxDJ-1 is observed in the cytoplasm (arrows) and perinuclear area (arrowheads) of RPE cells exposure to 400 μM H2O2 for 1 h (D) and 18 hrs (E). Cell nuclei were labeled with TO-PRO-3. Scale bar = 20 μm. From: Shadrach KG, Rayborn ME, Hollyfield JG, Bonilha VL (2013) DJ-1-Dependent Regulation of Oxidative Stress in the Retinal Pigment Epithelium (RPE). Increased levels of DJ-1 and oxDJ-1 in RPE lysates and tissue from AMD donors. Lysates of human RPE isolated from non-AMD (A to C lanes 1 to 5) and AMD donors (A to C, lanes 6 to 10) were harvested and analyzed by immunoblot assay with DJ-1 antibody (A) and oxDJ-1 antibody (B). Each lane contained 20 µg of protein. 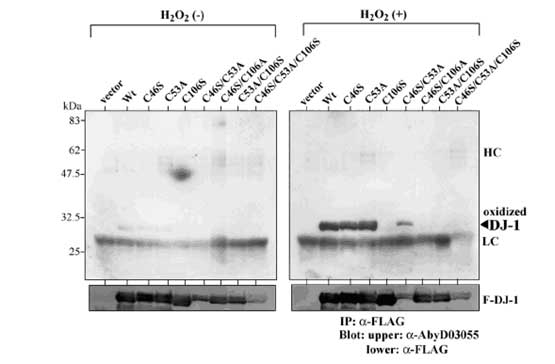 Protein loads were confirmed in replicate blots probed with GAPDH (C). Immunoblots of lysates revealed that AMD RPE displayed significant increased immunoreactivity of both DJ-1 (A) and oxDJ-1 (B) when compared to non-AMD RPE lysates. Quantification of immunoblots demonstrated a 1.7 and 4 fold increase in the expression levels of DJ-1 and oxDJ-1, respectively (D). Blue columns = non-AMD; Red columns = AMD. Data is expressed as mean relative signal intensity ± SEM (n = 8). Asterisks denote statistical significance compared with non-AMD RPE (*p = p = 0.0098 for DJ-1 and **p = 0.0058 for oxDJ-1). Alternatively, cryosections of different non-AMD (E–H) and AMD (I to L) donors with geographic atrophy, and isolated Bruch’s membrane (BM) and choroid from two different AMD donors were (M to P) labeled with DJ-1 antibody. Negative control sections were reacted with DJ-1 antibody pre-absorbed with lysates of cells overexpressing DJ-1 and shoed no DJ-1 labeling (E, G, I, K, M, O). DJ-1 labeling was detected mostly in the RPE nuclei (arrowheads) but also in the cytoplasm of non-AMD donors (F and H, arrows). Significantly more DJ-1 was detected all over the cytoplasm of RPE cells from two different AMD donors (J and L, arrows), while DJ-1 was diffusely distributed in isolated BM and in drusen (E, G, asterisks). Scale bars (E to L) = 10 μm; (M to P) = 50 μm. DJ-1-Dependent Regulation of Oxidative Stress in the Retinal Pigment Epithelium (RPE). Human anti Human DJ-1 antibody, clone AbD03055 recognizes the human DJ-1 oncogene only when it is oxidized on cysteine C106. DJ-1 plays roles in transcriptional regulation and reaction to anti-oxidative stress. The oxidation status of DJ-1, particularly at C106, modulates the function of DJ-1 (Canet-Avilés et al. 2004). 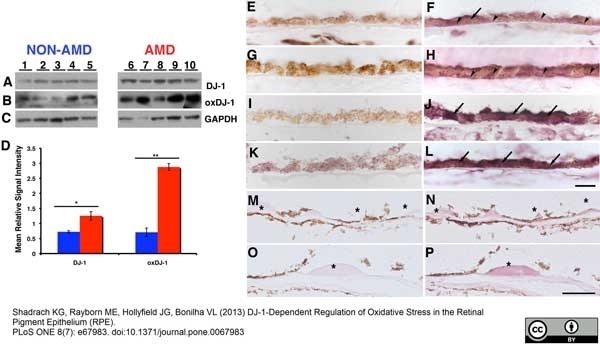 De-regulation of DJ-1 oxidation appears to be connected to the onset of conditions such as Parkinson's Disease (Abou-Sleiman et al. 2003). DJ-1 peptide oxidized at C106 (sequence LIAAIC(SO3)AGPTA). Sold under license of U.S. Patents 6753136, 7785859 and 8273688 and corresponding patents. By purchasing this product, you agree that your Name and Affiliation will be sent to Dr. Ariga, Hokkaido University, who first published this antibody in the journal Neuroscience Letters (Vol. 404, pp.166-169, 2006). His-tag is a registered trademark of EMD Biosciences. Ooe, H. et al. (2006) Establishment of specific antibodies that recognize C106-oxidized DJ-1. Neurosci Lett. 404 (1-2): 166-9. Shadrach KG et al. 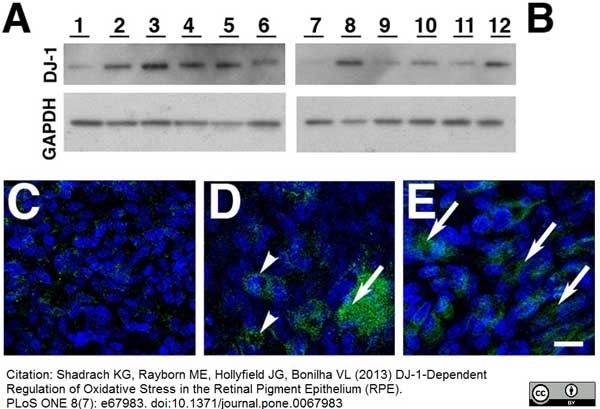 (2013) DJ-1-dependent regulation of oxidative stress in the retinal pigment epithelium (RPE). PLoS One. 8 (7): e67983. Andres-Mateos, E. et al. (2007) DJ-1 gene deletion reveals that DJ-1 is an atypical peroxiredoxin-like peroxidase. Proc Natl Acad Sci U S A. 104 (37): 14807-12. Bitar, M.S. et al. (2012) Decline in DJ-1 and decreased nuclear translocation of Nrf2 in Fuchs endothelial corneal dystrophy. Invest Ophthalmol Vis Sci. 53 (9): 5806-13. Zhang C et al. (2008) Role of NonO-histone interaction in TNFalpha-suppressed prolyl-4-hydroxylase alpha1. Biochim Biophys Acta. 1783 (8): 1517-28. Kim, J. et al. (2015) DJ-1 protects against undernutrition-induced atrophy through inhibition of the MAPK-ubiquitin ligase pathway in myoblasts.